Heart warming soup recipes & healing elixirs are found in the Raw Food Magazine "Time to Ditch Dairy!". You can get your copy at Raw Food Magazine or other online magazine retailers. They are kind enough to let me SHARE my page with you, so look below for this delicious Healing Elixir that is just in time for the cold season. 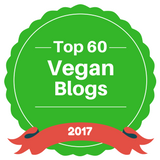 Artistic Vegan is also featured in a new Top 100 Vegan Food Bloggers list! Thank you all for your support and love. I couldn't do it without you! The write up is so kind, thank you for being with me over the years, my first blog post was in 2012 and here we are standing strong 6 years later. Premium is also growing, thanks for joining the artistic vegan family! Did you know you can GIFT a subscription? What a great holiday present! You can gift 1-month, 3-month, 6-month, 9-month or 1-year video subscriptions. How’s it work? When you check out simply click “ Gift to friend” and enter the email address of the giftee. The recipient gets an email, and can instantly activate their subscription and start watching. You can set a delivery date for any video gifts. When you gift a subscription you can opt to have it digitally delivered on a particular date. Send it on Christmas morning and it will arrive in the recipient’s inbox, shining and bright and digital or New Years, Birthdays etc. Give the gift of health with vegan meal plans, yoga classes and more exclusive content. ​Learn more on how to do it here. Thank you for reading! More content coming soon! !